Cyber Police Virus can be quite the alarming presence on your Android tablet or smartphone, and that is precisely the effect its creators are counting on. This virus is a type of ransom virus, with the help of which you will practically be blackmailed into paying a given amount of money in return for full access to your tablet or phone. What the virus does is sneak into your device, bypassing whatever security program you have protecting it, and then proceeds to lock your screen. All you will see is a message, informing you that your phone has been blocked by the legal authorities (police, FBI, etc. depending on the country you live in) due to some supposed violation they’ve detected. And of course, since this virus is similar to ransomware, it will under some form present to you the necessity of paying some amount of money within a given time frame. This is usually stated in the form of a fine. If you’ve been infected by Cyber Police Virus, you have probably noticed by now that no matter what you try, no matter how often you switch your device on and off again – the message does not disappear. Hackers have become sophisticated to the point that not only does the message sound legitimate, but the program has the capability of tracking your geolocation and from there determining the language in which to prompt the said message. Hence, making it even more believable. Step one in case of being targeted by Cyber Police Virus would be to take a deep breath and calm down. Do not panic and rush into paying the requested fine, because first and foremost, these are criminals at work here. They really couldn’t care less about unblocking your phone or tablet, and therefore it’s not guaranteed that once you pay the ransom, you’ll get your access back. In fact, it’s very likely that you won’t. What’s important to understand is that the creators of the Cyber Police Virus and others like it only do this for one simple reason: to earn money. By paying them whatever ludicrous sum they’re trying to extort from you, not only will you be throwing your cash out the window, but you will also be offering them the proper encouragement to go on this way. Whichever way you choose to look at it – we all lose. And by ‘we’ only decent citizens, who don’t go about meddling with other people’s property in order to make a profit, are implied. First thing’s first and that would be to remove the virus. Yes, it really is that simple. This guide will walk you through the process, step by step, as shown below in detail. At this point, it would probably be of use to you to learn some basic information about how Cyber Police Virus infects our gadgets and how much we can do to protect them from any harm similar to this one. Like more or less any malware, Cyber Police Virus is distributed via the almighty Internet. It’s very possible that you may have landed on some obscure, virus-ridden website, while browsing, and that is how the awful program creeped into your tablet/phone. Another very common technique and one of the oldest tricks in the book is program bundling. So, again, if you found yourself on one of those highly untrustworthy websites and even proceeded to download something from there, there’s a fat chance of downloading a virus along with whatever it was you were after. And the tricky thing about Cyber Police Virus and other such malevolent offspring of their criminal developers is that it’s very well equipped to go right past most security programs. Try to invest in a proven and established protection program, in order to ensure maximum possible safety of your device. Enter Safe Mode on your Android Phone/Tablet. How to do that? For Most Android Devices it is enough to hold down the Power On/Off Button => Select Power Off but do not tap on it as you would normally do. Instead hold it down until a message pop-ups asking if you want to enter Safe Mode. Confirm your Action. On certain Samsung Android devices this process would be a little different. For Samsung Galaxy S3 – Power Off your device. Turn it on and hold down the Volume Down button once the Samsung brand logo shows up on your screen. For Samsung Galaxy S4, S5, S6 and Note users – Power Off your device. Turn it on and once the Samsung logo shows up on your screen start fast tapping the soft menu button situated on the left side of your device next to the Home button. You can check the picture below for a visualization. If you can’t access your Power Down/Reboot menu as a result of the effects of the Cyber Police virus – take your device’s battery out. Put it back on. Follow the rest of the instructions for entering Safe Mode on your Android Phone/Tablet. If you were successful at the bottom left of your screen you should see an image similar to the one in our example. Once in Safe mode you should be clear of the Cyber Police Virus’ lock on your device’s screen. Locate any suspicious files or apps that you have downloaded recently and safely delete them. 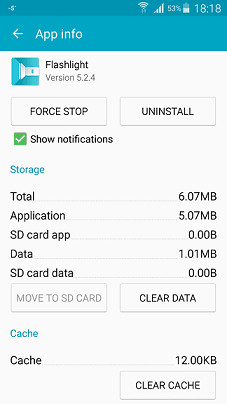 Normally you remove Android apps from the Settings menu -> Apps/Application Manager -> Downloaded/All -> Select the suspicious App. Naturally, “Flashlight” is not suspicious, merely an example to show you how the menu should look like. In there you will see a list of apps that have admin status within your system. 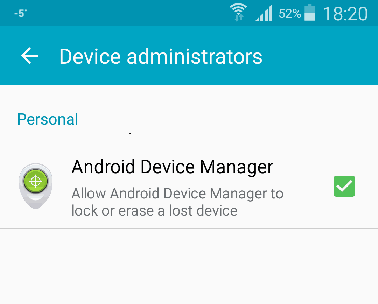 They’ll probably be listed under the Android DeviceManager. Remove the problematic App from this list. Now you should be able to remove it as normal. Now it is time to leave Safe Mode and use your phone as you would normally do. This can be a bit tricky. Normally it is enough to hold down the Power On/Off button and simply Restart/Reboot your device. If that doesn’t do the trick and you are still in Safe mode take out the battery and put it back on after 4-5 mins. That should do the trick. what kind of devise are you using? what kind of devise are you using ? You are most welcome! Be sure to contact us again, should you happen to run into a similar problem. What problem are you dealing? What is getting you confused? To boot into Safe Mode on this particular tablet model, you must turn off the device and then hold the power button until the developer logo appears. Once this happens, you must quickly press and hold the volume down button. This is how you get the Safe Mode option to appear on your screen – once it happens, tap on the option and your device should boot into Safe Mode. I have an Icraig CLP289 and cannot get into recovery mode to do a hard reset. Please help. What happens when you try to enter Recovery Mode?